The price of residential electricity in the EU is correlated with the level of renewable energy installed on a per capita basis. The data shows that more renewables leads to higher electricity bills. The notion that renewable energy is cheap is one of five Green energy myths discussed. 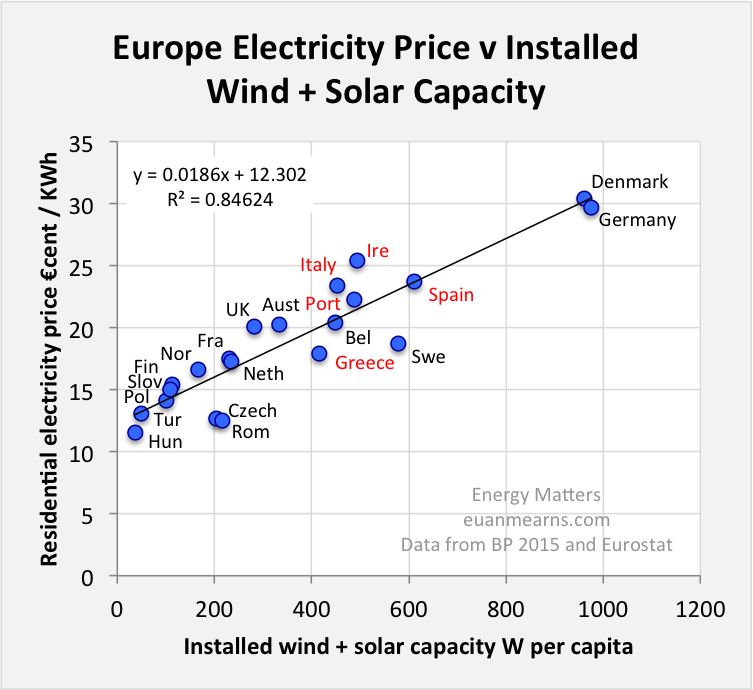 A few weeks ago Willis Eschenbach posting at WUWT and Jonathan Drake posting at Paul Homewood produced a chart showing a relationship between European residential electricity prices and the installed renewable energy (RE = wind + solar) per capita for a number of European countries that I have reproduced below. I thought this was one of the most interesting charts I’d seen for a while and wanted to write a post on it, but Dave Rutledge posting at Judith Curry beat me to it. So why do I think this is important and why do we need another post? Well, the notion that RE is cheap is one of a number of Green energy myths that has become engrained in the public psyche. President Obama evidently believes that renewable electricity is cheap and expanding RE supplies was part of the medicine recommended by the IMF / EU to cure Greece’s economic woes. I have been told many times by those who make their living peddling renewable hardware that RE has brought down European electricity prices. I’m afraid there is little evidence to support that notion in Figure 1. So where does the truth lie? Figure 1 The Y-axis shows residential electricity prices for the second half of 2014 from Eurostat. The X-axis installed wind + solar capacity for 2014 as reported in the 2015 BP statistical review normalised to W per capita using population data for 2014 as reported by the UN. There will most certainly be more than one variable at work in determining electricity prices in the various countries. However, it is impossible to escape the conclusion that countries with highest level of renewable penetration have the highest residential electricity prices and that it is highly likely that these high prices are caused by, to a greater or lesser extent, the high level of RE penetration. These and related data are discussed in greater detail in the second half of this post. The notion that renewable electricity is cheap is one of a number of Green Myths that have been woven into a gigantic Green lie that is undermining our society, our welfare, our institutions and the way that we think about and rationalise problems. Exposing this Green lie is part of the core raison d’être of Energy Matters. Green mythology is a theme that I will return to in the months ahead. Below is a very brief summary of some prominent Green energy myths. If readers want to add to the list, feel free to do so in the comments. A ubiquitous feature of Green myths is that all have a grain of truth running through them. In Green mythology, this grain of truth becomes elevated to the whole truth and used to make false arguments either in favour of renewable energy (RE) or against the alternatives. As far as I am aware there has yet to be a radiation related death in a civilian nuclear power station (note that Chernobyl was a military reactor). Normalised for power produced, nuclear power is the safest form of power generation on Earth. And yet the peddlers of Green mythology have managed to create an aura of fear around this safest form of power generation. Like flying, nuclear power is a high risk high reliability industry. Hundreds die in air accidents all the time, but we carry on flying. Civilian nuclear power has an impeccable safety record, and yet many countries have turned their back on it, which is surprising since it is the only form of low carbon electricity that could actually power our society as it is currently configured. Business as usual is not part of the Green agenda. Yes it is true that in certain countries the price of gasoline and natural gas are subsidised by governments, this happens throughout OPEC. These governments are subsidising prices of fuel, electricity and often food, shielding their poorer citizens from high prices struck on international markets. Subsidies paid by governments to fossil fuel production companies are minimal to non-existent. In fact, the FF companies are normally paying high taxes and subsidising the host governments quite heavily, the exact opposite of what the Green myth asserts. Again in cases this can be true. Wind in the morning followed by midday Sun followed by a high tide in the afternoon may create a pseudo continuum. But equally likely is a strong sea breeze at midday, coincident with a solar peak and a midday high tide producing a vast uncontrollable spike in RE that would have to be curtailed. I don’t know how many times I have been told that RE is bringing down the price of European electricity. This is a myth born out of the market mechanism that dumps electricity spot prices at times of RE over-supply. Expensive RE dumps the price of all electricity that is subsequently sold at a loss. This myth has been peddled with such great success that even President Obama appears to believe it. Economics is not my strongest point and so I am unsure how exactly electricity pricing and billing works in practice. One thing I do know is that it is important to distinguish between cost and price. The RE generators are guaranteed their cost+profit regardless of spot price and this is paid for by consumers, regardless of spot price. Someone has to be left chewing losses. I’m guessing this must be the large energy companies that we all know are in deep trouble. Putting them out of business does after all lie at the core of the Green anti-capitalist plan. These costs are offset but not cancelled by the low recurring cost of fuel and the net impact is clear. High renewables penetration causes high electricity price. Ed Hoskins provides a clear picture of how these costs stitch together in his excellent report. One may often hear the argument that wind will soon be competitive with gas and the price of solar panels is coming down. But claims such as these focus only on the installation capex and performance and ignore all of the added system costs detailed above. In Figure 1 the PIIGS countries are highlighted in red and it is an interesting observation, also made by Dave Rutledge, that these countries have high debt (unsustainable) and struggling economies. It is a gross oversimplification to suggest that RE may have contributed to the stagnant economies of these countries, especially since Germany and Denmark have two of Europe’s most successful economies. I think we can conclude that a strong economy can withstand the pressure of high RE penetration. I think we can also conclude that high electricity prices in the PIIGS is like a tax or surcharge on the use of energy and that this will be detrimental to economic growth. We have likely witnessed a vast misallocation of capital. Money that could have been spent promoting economic growth has instead been spent on grid destabilisation and penalising the populations of the PIIGS countries with levies. Dave Rutledge suggested that the intercept of this plot would give the electricity price in a system with zero renewables which in Figure 1 suggests €cent 12.3 / kWh. I wanted to try and estimate what a 100% RE system might look like and have replotted the data looking at wind + solar consumption as a percentage of total electricity consumption (Figure 2). Assuming a linear relationship, which is unlikely to be valid, a price of €cent55 / kWh is projected. This is 4 times more expensive than a low RE system today. I’d suggest the reality could be much higher as the proportion of cheap CCGT balancing services diminishes the price of an RE system may increase exponentially. Figure 2 This plot is a variant of Figure 1 where wind+solar consumption as a proportion of total electricity consumption is plotted on the x-axis. 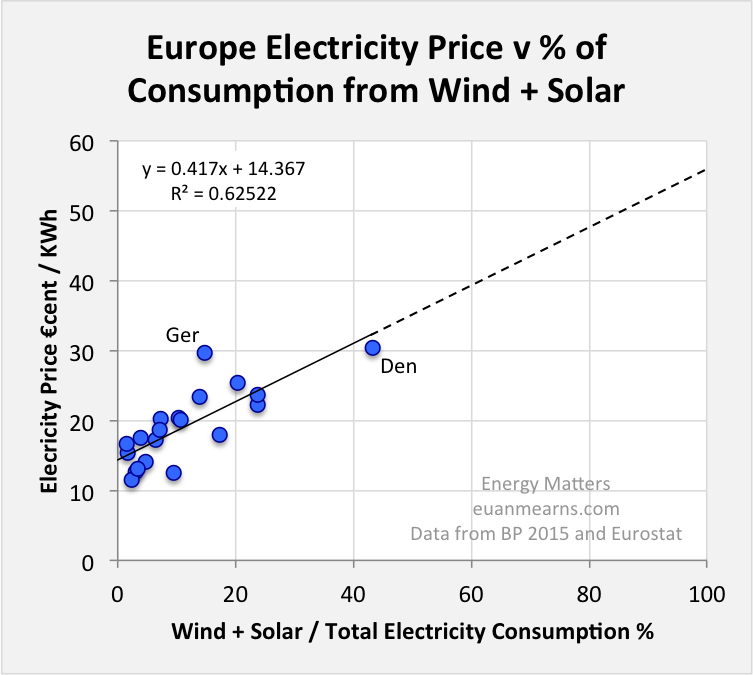 Linearly extrapolating to 100% indicates a price of €cents55 for a 100% renewable system. Germany stands out as an anomaly on this chart, no longer alongside Denmark. This is perhaps due to German wind having a lower load factor. It could also reflect German wind exports and or curtailments. Figure 2 reveals an anomaly in that Germany no longer sits beside Denmark. Part of the explanation lies in the wind data where Germany lies on a low-performance trend. Denmark and the UK lie on a much higher performance trend (higher load factor) (Figure 3) that may reflect the higher proportion of offshore wind in those countries. This of course is also higher cost wind, but this is a story for another day. Another part of the explanation lies in the higher deployment of solar PV in Germany that has a lower load factor than wind. Whatever happened to German obsession with efficiency? Figure 3 Wind consumption versus installed capacity for selected European countries. The trends are time series 2000 to 2014. 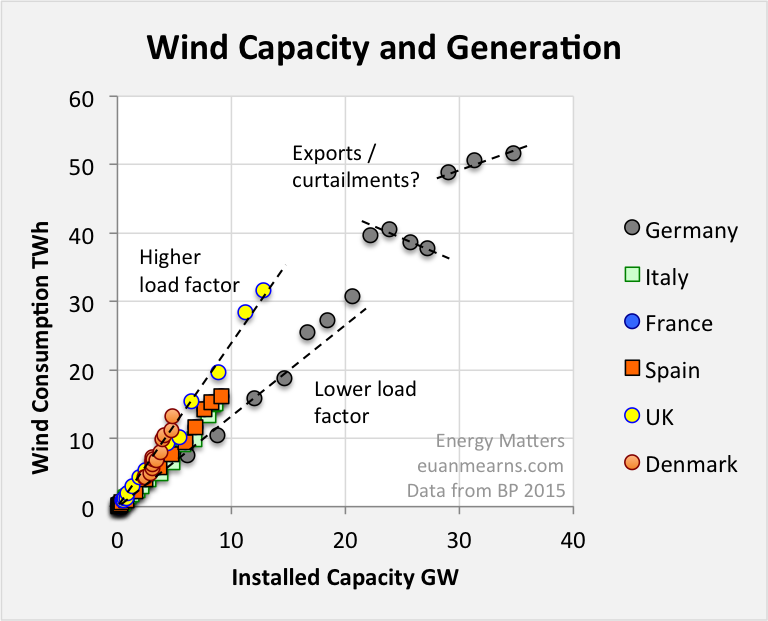 Denmark and the UK, both with significant offshore wind, are on a higher load factor trend compared with Germany. The differences are quite substantial, approaching double output in the former compared with the latter. The recent history in Germany may indicate curtailments or exports since BP are reporting consumption, not production. Finally, we are repeatedly told that in addition to being dangerous, nuclear power is also expensive. Is this another Green myth? 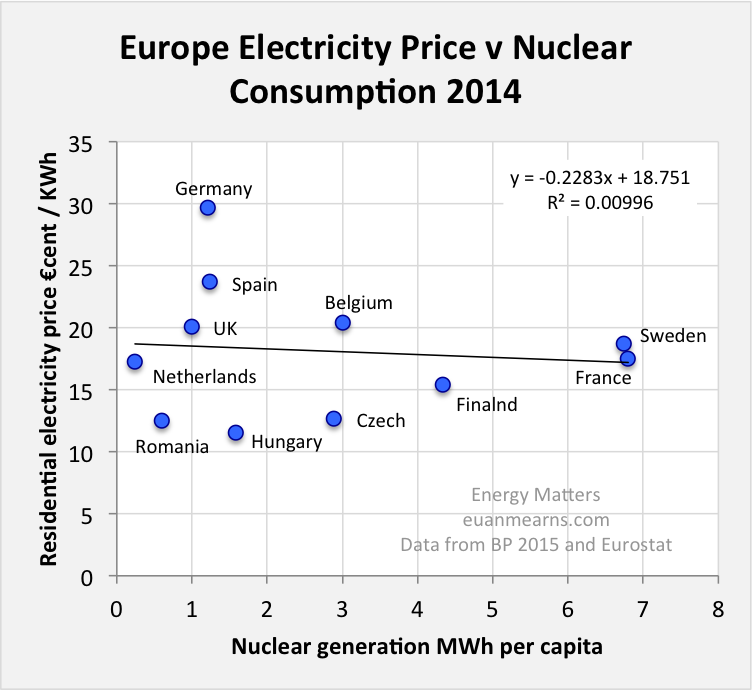 In Figure 4 I have plotted the per capita nuclear generation against electricity prices. High nuclear France, Sweden and Finland have some of the lowest electricity prices in western Europe while low Nuclear Germany has the highest. Enough said! Figure 5 Analagos plot to Figure 1 but for nuclear. There is no correlation between the level of nuclear penetration and price although high nuclear France, Sweden and Finland have significantly lower prices than low nuclear Germany. In conclusion, the various Green energy myths detailed above are woven into an energy narrative that is tantamount to a lie. The surprising and worrying thing is that this lie has been accepted and adopted by the UK government, the EU and the UN. They seem to believe it is founded on science and engineering. It is not. What has happened to the checks and balances that our Lords and scientific advisors are supposed to provide? The Appalling Truth About Energy Subsidies. Decarbonizing UK Electricity Generation – Five Options That Will Work. The Difficulties Of Powering The Modern World With Renewables. How Much Wind And Solar Can Norway’s Reservoirs Balance?. A Trip Round Swansea Bay. European Renewable Energy performance and costs: 2014.